This Is My Father is a 1998 Irish-American romantic drama film directed by Paul Quinn. It tells the story of an Irish couple from the 1930s and their son trying to find his roots. 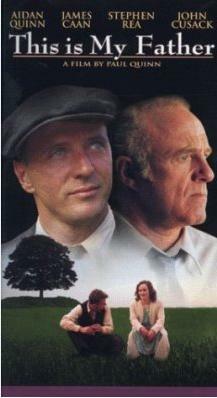 The film portrays a tragic love story set in late 1930s Ireland, focusing on the relationship between Fiona Flynn (Moya Farrelly), a beautiful, feisty seventeen-year-old from a middle-class family, and Kieran O'Dea (Aidan Quinn), a shy labourer in his early thirties, and the search decades later by their son, Kieran Johnson, (James Caan) to find his roots in late 1990s Ireland. The film is told as an interweaving of the nineties setting, where Kieran is hearing the story of his parents, and the events of the 1930s. Kieran Johnson grew into adulthood unaware of his parents' story or of the tragic events that caused his mother to leave Ireland on her own while pregnant. The story highlights the issues of prejudice, classism, alcoholism and social and religious conservatism in rural 1930s Ireland. ^ "This Is My Father". IMDb. Retrieved September 12, 2011. This page was last edited on 13 October 2018, at 05:01 (UTC).